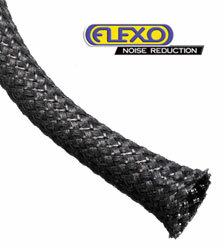 Flexo Noise Reduction sleeving is engineered from a mixture of monofilament and multifilament PET yarns tightly braided together to fabricate a durable sleeve to protect wires, cables and hoses from sharp elements and friction that can severely impact their functionality. The tight braided design prevents heat or moisture from being trapped inside while also helping reduce noise from wires, tubes, and hoses. 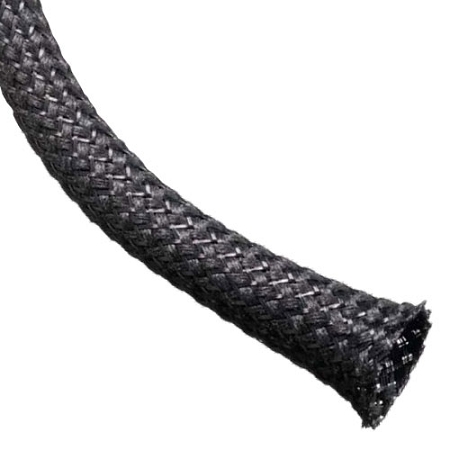 Withstanding temperatures between -94°F and 257°F as well as being resistant to hydraulic fluids, solvents, and UV light makes this durable sleeving excellent for indoor and outdoor applications. Making this braided sleeving expandable allows for easy installation over large connectors and through tight angles. Flexo Noise Reduction Sleeving is applied to electrical wires, cables, and hoses in office, warehouse, and home settings where noise is a constant battle and cable management is highly needed. 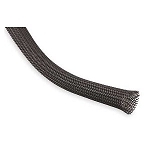 This noise reducing braided sleeving is made in black to give it a professional look. All Spools may have a up to a few splices.